Isn’t it amazing how life unfolds? What is it that makes the world go round? How does each step lead to another? For instance, what made me buy a van in 2001, go on a family camping holiday, have a late night session with friends, at 7am the next morning hand the Sunday Tribune property pages to my 10 year old to read so as to gain an extra hour, and consequently end up visiting an amazing ten bedroom house for sale, put in a mad offer on the afore mentioned house, have the offer accepted while in Kerry where I bumped into a friend who was an auctioneer who then practically sold my Dublin home by the time we returned from the camping holiday? Was it meant to be or did I determine it? The links between coincidence, determination, and fate have always fascinated me. I like the phrase ‘self determination’. I think it combines two related aspects of the world: the mind of the individual and the force of evolution. It is interesting how they entwine. This train of thought has been ranging around my mind recently as a result of my sojourn in London last week to celebrate my brother’s sixtieth birthday. It was a special occasion for him. Sixty years ago, it was a special day for my mother who gave birth to her first child. Two inextricably linked but very separate events strutting and fretting their hours across the stage. So I got to thinking about the impact of time, the role of circumstance and the minds of people and, coincidentally enough, I visited three very different exhibitions which also made me reflect on the nature of life and evolution. Each one, in different ways, made me conscious of the minute and the magnified and the connection between the smallest particle to the absolute whole, between the here and the there. The three exhibitions I visited were Anselm Kiefer at the Royal Academy, William Turner at the Tate Britain and The First World War at the Imperial War Museum. For me, in very different ways, each one of them focused on the importance of detail in life and how extraordinary it is when you see the detail behind the creation. If it doesn’t sound too pompous, each exhibition captured the magic of art in that art happens when the essence of life, cause and effect, is captured on canvas, on the page or in the choreography of the installation. The first exhibition I saw was the William Turner at The Tate. I have always loved William Turner’s sea and city scapes. I was introduced to him by my first love, so there is a sentimental attachment too which will generate its own spin on my mind, but I love how the washed out strokes of his water colour paintings create the broad watery surfaces of the ocean, the fading yet brilliant intensity of sunset and dawns. His yellows, burnt oranges, hues of blue and green draw me in to the paintings. Brilliant! After a minute or two of staring, out of the swirl of colour, out of the brush strokes of sea or land scape, the details of civilisation emerge out of the storm or trees. The fine intricate lines of distant churches, bridges, buildings slowly emerge through the light. Amazing! Suddenly you see, beneath the maelstrom, the detail of people. Next I went to the WW1 exhibition at the Imperial War museum. This was detail in your face! Loud, graphic, brash, it leads you through the perils of nationalism, hatred, love, war using historical artefacts (uniforms, helmets, rifles, powdered egg) film, art, education. It is brilliantly curated so that you journey across all fronts (educational, emotional and actual war fronts). I left feeling assaulted, exhausted, and horrified at our capacity for destruction and exhilarated at our ability to survive. Finally, after spinning through the crowds and queues of Piccadilly, I found myself staring at the enormous canvases of German artist, Anselm Kiefer. According to the ‘blurb’ Kiefer is absorbed by our purpose on earth and our relationship with the celestial and human history. His canvases are installations of sand, shale, concrete, paint, brick, sawdust, ash. He uses sunflowers frequently in his canvases. 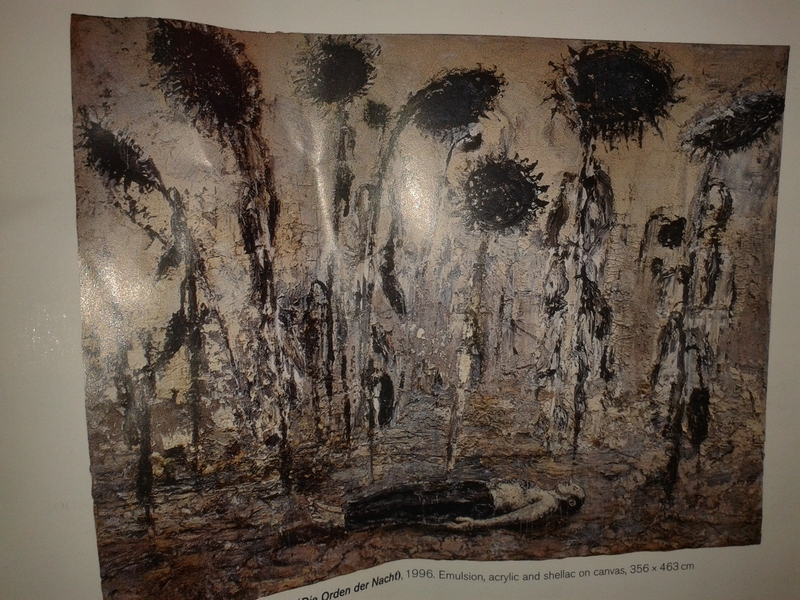 He said “when I look at ripe, heavy sunflowers bending to the ground with blackened seeds…I see the firmament and the stars.” I loved the contrast and contradictions of humanity, destruction, re-birth and re-construction in his work. So who are we in this universe and what role does each of us play? Are we each a black sunflower seed? We need to determine for ourselves but we cannot without each other or the various constructions we or the universe composes. To celebrate his birthday, my mother had to give birth to my brother. Even now, here, as I write with pen and paper in the year 2014, alone in this dark early morning, in the lamplight, in the middle of nowhere, my meandering thoughts are yielded to the page and transferred to you, the reader, forcing you to stir (be it with boredom, heavy sigh or amusement), yet that is not my intention. I just want to decipher myself, but in so doing, I need you to help me by being there. So, thanks for that!